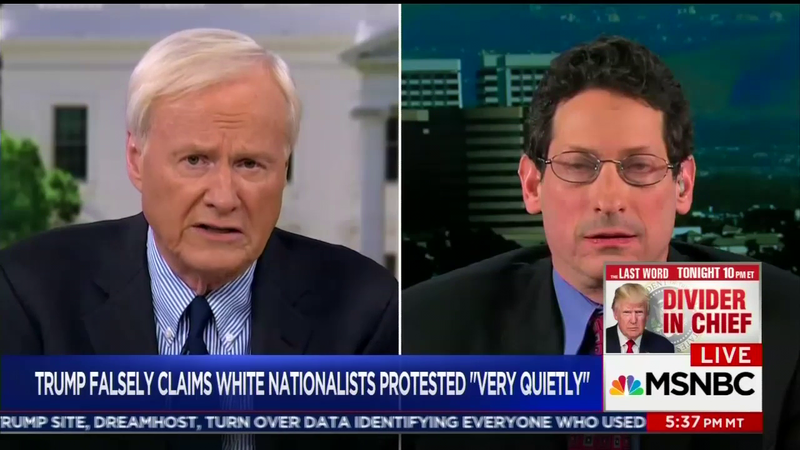 On Wednesday, Antifa was given prominent and positive coverage on MSNBC and not only did it go beyond the pro-Antifa MTP Daily segment but extended to Hardball. Host Chris Matthews featured a guest that gushed over the violent leftists as “diverse” and mostly “peaceful” while another was pathetic unprepared. They are strictly principled anti-fascists. And what they see in the Trump administration and what they see happening in this country, they see the neo-fascism that we see and they have taken a principled stand to stand against white supremacists and white nationalists wherever they may show up. I like to point out that Antifa at Charlottesville protected peaceful protesters. I don’t know what President Trump was talking about.